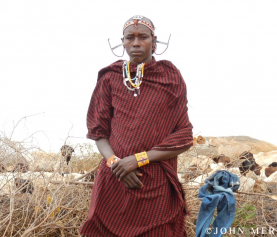 Murrans [Maasai warriors] are tasked with defending all those in their community, and Guardians embody this role – they protect people, livestock, lions, and more. Our office and data manager Merishi sent us an update on one recent event where a Guardian went above and beyond to keep his community safe and intact. On the morning of Tuesday 10th April, 2018; Guardian Lenku received disturbing news of three rams (sheep) that were stolen by unknown culprit. The incident happened very early in the morning at his zone in Inkoisuk. The animals stolen belong to Mpapa. 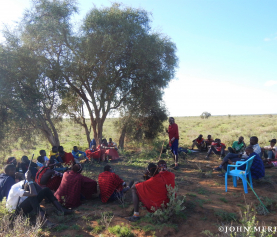 The Guardian joined the rest of the community members and Big Life scouts in the search for the stolen livestock. They picked up the footprints of the suspect as well as the livestock tracks near Inkoisuk bomas. Luckily, after walking tens of kilometers, they found the thief in the evening at Norkiushin. The entire team was happy since all the three rams were found safe and alive. The animals however looked exhausted after they were driven from a far distance. What surprised the team is that the culprit happened to be from the same family with the livestock owner. He was handed over to the police for the law to take its course. Guardian Lenku explained that the search was challenging since it was raining. The area also had dense vegetation. This made it difficult to track both the suspect and the livestock. Thus, it took them a whole day to get hold of the thief. He however termed the rain as a blessing since it is the reason why the livestock slowed down and this enabled them to catch up with the thief. He is happy that they managed to soldier on to a fruitful end. 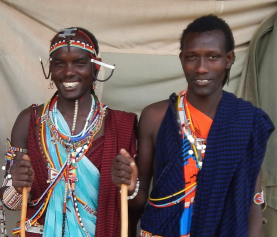 Thanks to Lenku and all the Guardians for everything they do to defend and protect their communities!